The photography workshop offers two skilled and passionate photography instructors in a very small group setting, ensuring that guest photographers get the fullest advantages of prime scenic locations and one-on-one tuition and guidance. The workshop is geared towards photographers with at least a basic understanding of their equipment, and who want to spend more time on growing their technique and photographic knowledge. To this end, several critique and feedback sessions have been built into the workshop where photographers are able to discuss the images they have shot during the workshop itself. Beginner photographers shouldn’t feel intimidated by this though. With a maximum guest attendance of only 6 photographers with 2 instructors, there is ample opportunity for on-on-one instruction. Along with the feedback sessions, there are also several ‘theory’ sessions: informal discussion style sessions were we discuss theory and technique before practising in the field (examples include panoramic stitching, long-exposure technique, filter use, star-trails and night sky photography). Working with extreme long-exposure images. An early 5:30am start with tea and coffee before we head out to the rocks in front of the Hole in The Wall village to shoot the dawn light. We return after the sun is up, have breakfast followed by a theory session on long exposure photography. Before lunch there is a rest period for everyone. After lunch we reconvene in the lounge to do some guided image editing of the morning’s photography. Towards the middle of the afternoon we head out to the Hole in The Wall viewpoint and beach to photograph this incredible feature of the Wild Coast. There is a short walk of about half a kilometre from the viewpoint parking to the beach below. The access is very easy and is manageable for most photographers. If the tide is low enough we will even be able to cross the river in order to create images with beautiful round pebbles in the foreground with the afternoon light spilling onto the Hole in The Wall massif itself. After night has fallen we return to our lodgings for dinner. 5:00 am: It is time tea and coffee after which our group can split up. Those feeling like a strenuous climb can opt for the incredible view from the top of the rocky bluff to the north of Hole In The Wall. Those wanting a more sedate shoot can opt for Ferdy’s Gully, a 20-minute bumpy drive from the Lodging. The group reconvenes for breakfast around 8:30-9:00am. We again spend the last part of the morning discussing theory (panoramic stitching and star-trail photography) before having a rest. We have a very late lunch at White Clay where we sit down at a restaurant overlooking the pebble beach south of Coffee Bay. As the light softens in the sky we make our way onto the pebble beach to play with long exposure images. The fourth day starts with an optional dawn shoot, the location depending on who wants to get up early to shoot. For those wanting to rest, it is an opportunity to lie in before we make our way to Port St Johns. After a leisurely breakfast we make our way along the dirt roads to Port St Johns, stopping when the mood arises to photograph the coast and houses that dot the rolling hills beyond the coastal cliffs. 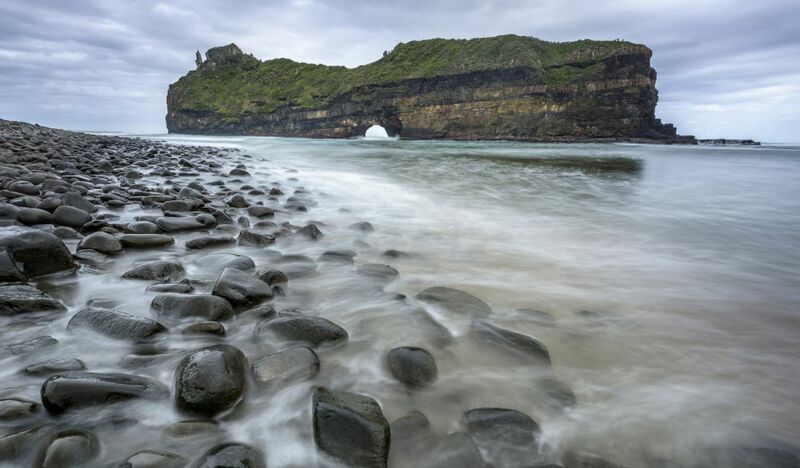 Port St Johns is considered by many to be the gateway to the Wild Coast and is arguably the most important town in the area. It lies at the mouth of the Mzimvubu River after the river flows through enormous mountain ramparts known as ‘The Gates’ (Mount Sullivan to the north and Mount Thesinger to the south). We arrive in town to have a late lunch in one of the distinctive Port St Johns restaurants. We depart from our lodging to explore the summit of Mount Thesinger for sundowners and late afternoon/sunset photography. 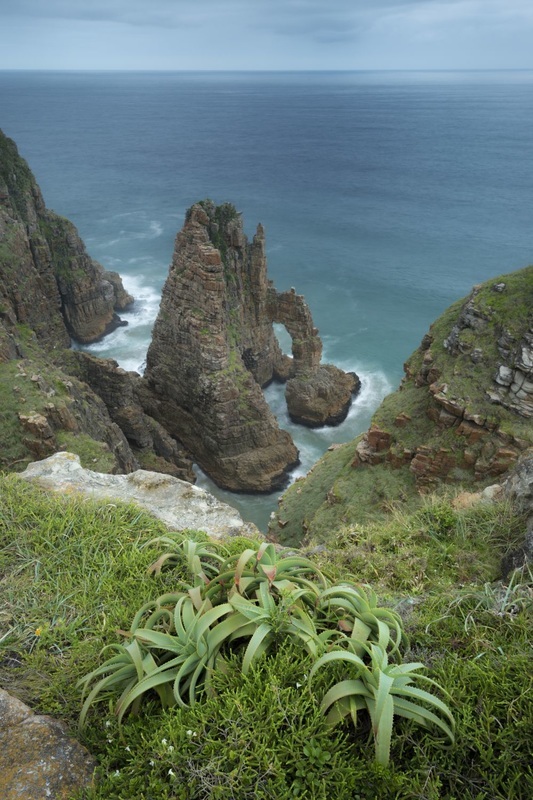 Mount Thesinger is the site of the Port St Johns airport and boasts a commanding view of the Mzimvubu River as it opens to the Indian Ocean. It also has several beautiful trees and almost soulful bare branches that make for excellent black and white photography subjects. After a light finger supper on the summit we turn our camera’s to the ocean and photograph the milky way and star trails over Port St Johns and the mouth of the river. Today is a rest morning to allow everyone to catch up on sleep. After a leisurely breakfast at our lodgings we spend the morning in guided image editing followed by a feedback session. Should we have overcast weather it may be worthwhile to photograph the rural Port St. Johns hinterland with its colourful African rondavels dotted on the hills. After lunch After lunch we do a coastal shoot near Port St Johns. After a successful afternoon we return to our lodgings for dinner. We have an early morning start after coffee and tea and at 5am so as to make our way back to Mount Thesinger for a dawn shoot. We return at around 8am for breakfast. After packing the vehicles we join the long windy road to Lusikisiki and then down the rolling grasslands to the fishermen’s post at Luphuthana. 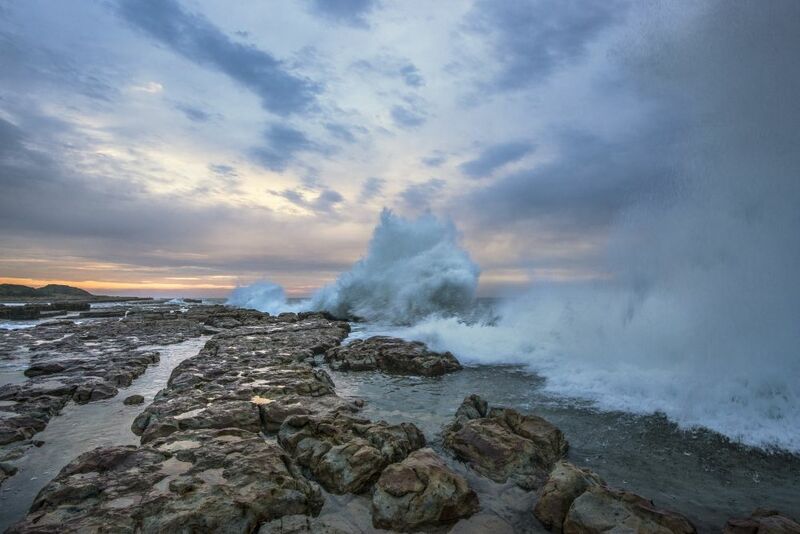 The attraction of Luphuthana is the immense waves that crash against the rock shelf along the shoreline. Towering white pillars of spray break against the rocks on a regular basis, leading to some very interesting photography opportunities. As it is, we spend our first afternoon at Luphuthana playing on the rock shelf and working with photographing the waves in the fading light. After dinner we have an early night as the following morning is another early start. An early 5:00 tea and coffee with rusks before we walk to the astounding Waterfall Bluff. This waterfall falls in a beautiful curve directly into the ocean. A small cove shelters this scene, allowing photographers amazing access to this beautiful landscape feature. 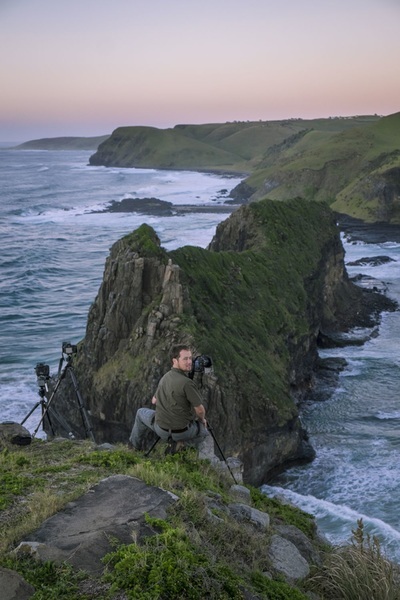 We aim to reach Waterfall Bluff by sunrise so that photographers can take advantage of the soft predawn light. The walk itself is easy and takes approximately 40-50 minutes of slowish walking (it’s roughly 4k to the Bluff from Luphuthana). After dawn, any photographers who would like to can continue to the dramatic and impressive Cathedral Rock. This takes approximately another hour to reach. Photographers not wanting to exert themselves too much can return to Luphuthana. After lunch we spend the afternoon in guided editing and a feedback session followed by rest and dinner. Once the sun has set we make our way onto the rock shelf again to photograph the nigh sky superimposing dramatically flash lit waves against the Milky Way. For our last early morning rise we head out to explore Magwa Falls and Fraser Falls after a 5:00a, tea or coffee with rusks. 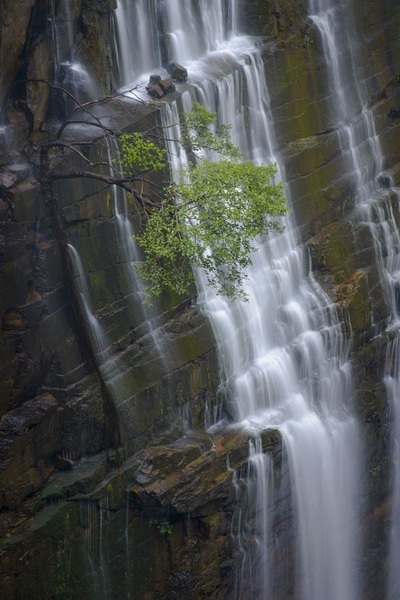 Magwa Falls is an incredible, and often missed, waterfall that cascades 142m down into a narrow ravine. The unprotected edges make for nervousness, but viewing the Falls can be done safely (visiting Magwa Falls is one of the few spectacular waterfalls that are truly unconcontrolled- no fences even- creating the sense that you are the first to view it). After visiting Magwa Falls we stop by the impressive, but basically inaccessible Fraser Falls, before heading back to Luphuthana for some editing and a rest. Once we have had some lunch we have a short feedback session before heading out to the grasslands above Luphuthana. These rolling hills afford some beautiful opportunities to create abstract landscape compositions with solitary trees, or cattle grazing under an azure sky. Once the sun has set we make our way back to camp for a restful evening by the fireside. Our last morning is spent once more photographing the waves on the rock shelf in front of Luphuthana. The early morning light and clouds (hopefully) come together to create a fantastic purple backdrop for the waves to be highlighted against. 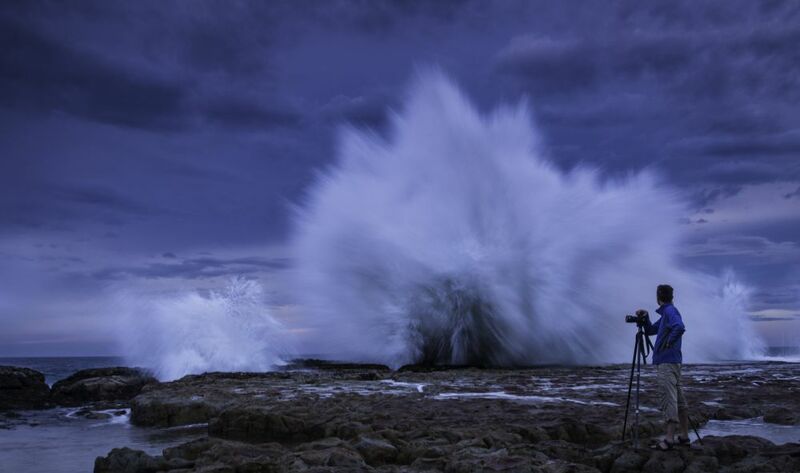 On top of this, being near the crashing water is a fantastic way to end this wonderful workshop on the Wild Coast. Once we have had our breakfast and portered our equipment across the Luphuthana River we make our way back towards Durban and home. We can do this workshop any time of the year. Email us for more information. R26,000 per person (approximately USD 1,795 / EUR 1,560 as of October 2018 Exchange rates). Minimum 3 participants, maximum 6 participants. We indeed feel the tour is very competitively priced. 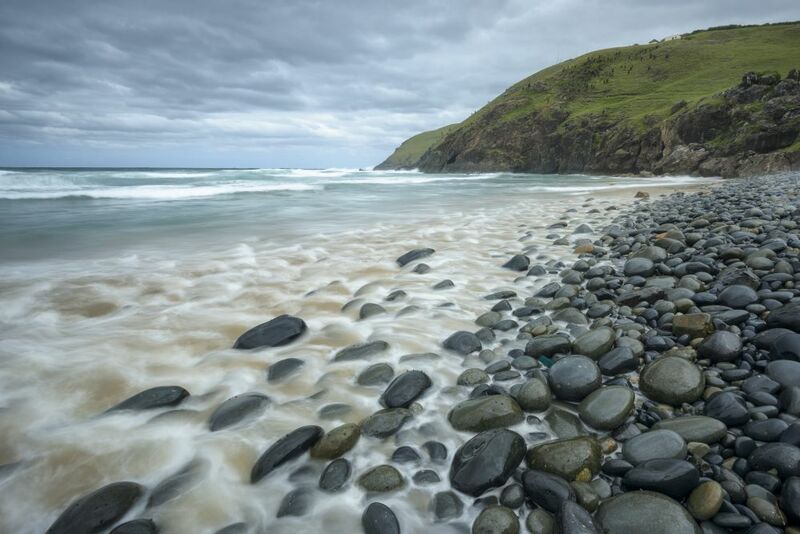 Just Google “Wild Coast photographic workshop” and see what prices you get, and what you get for those prices. Cheaper options are few, and they invariably use cheap accommodation that may not be the best location for your photo shoot. Or they exclude transport for example so you are required to drive yourself around. We are confident in our best value for money approach, where we don’t cut on quality, offer a pretty much all-inclusive tour at a fair price. Given that the tour leaders are South Africans and that South African salaries and taxes are considerably lower than their European counterparts, we are able to pass this saving on as a rather more competitive price. Want to see pictures from previous years? Check out our blogs on Africa Geographic!